He came to Ohio State as an engineering major, while still booking shows all over the state in cities like Athens, Cleveland, Cincinnati, Columbus and Toledo. He even booked mini tours for several acts, including the now-hit band Twenty One Pilots. Eventually, Leubitz switched his major to marketing, and was in an advisor’s office when he saw a list of minors, including the Music, Media and Enterprise (MME) minor offered by the School of Music. Today, Leubitz works as a booking coordinator at Paradigm Talent Agency in New York City, where he works with a team to help create, build and manage artists’ touring businesses and careers. The minor also helped him look at some of the practical considerations of going into an entertainment field. 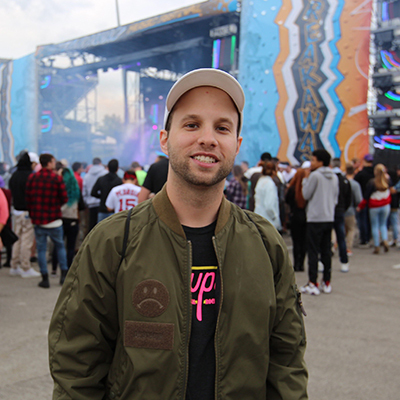 Leubitz has worked on tours for D.R.A.M., RL Grime, Ghosttface Killah, Michael Christmas, Graves and more.